A new natural history of destruction? 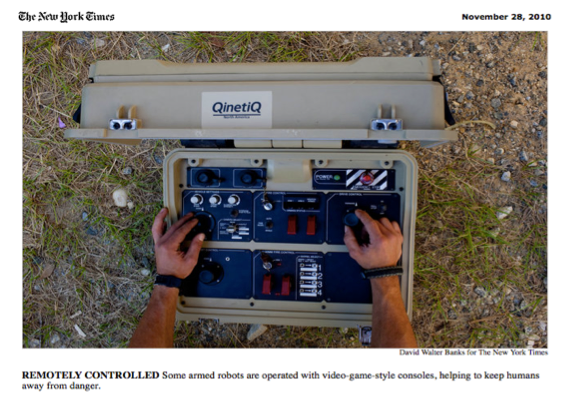 Remotely operated and robotic systems are central to contemporary military operations. Robotic weapons can select targets and deliver lethal force with varying degrees of human control, and technologies for fully autonomous weapon systems are currently in development. Alongside military reconnaissance and the prospective configuration of ‘killer- robots,’ drone technologies are being deployed for ostensibly peaceful purposes, most notably surveillance of public space, private property and national borders. More generally, the frame offered by contemporary security discourses has redrawn previous boundaries regarding the use of state violence in the name of homeland protection. But despite an extended history of investment in technologies that promise to rationalise the conflict zone and accurately identify the imminent threat, the legitimacy and efficacy of actions taken in the name of security is increasingly in question. example, in April of 2013 a coalition led by Human Rights Watch initiated a campaign in favour of a legally binding prohibition on the development, production and use of fully autonomous weapon systems. Simultaneously, some military and robotics experts emphasize the advantages of automated weapons and argue that equipping robots with the capacity to make ethical judgments is an achievable technological goal. Within these debates, the ‘human in the loop’ is posited alternately as the safeguard against illegitimate killing, or its source. Implicit across the debate is the premise of a moment of decision in which judgements of identification and appropriate response are made. While emerging arms control strategies focus on the ‘red line’ that would prohibit the development and use of weapons that remove human judgment from the identification of targets and the decision to fire, the question remains to what extent human judgment and decision-making are already compromised by the intensifications of speed, and associated increase in forms and levels of automation, that characterise contemporary war-fighting, particularly in situations of remote control. Rather than attempting to establish one or the other of these concerns as correct, or even as more important than the other, we seek to focus our discussion on the troubling space between automation and autonomy, to understand more deeply their intimate relations, and the inherent contradictions that conjoin them. To explore the key stakes and lines of argument in this debate, we invite contributions from scholars in the fields of security, peace and conflict studies, international human rights law, anthropology/sociology of science and technology, technoculture and technomilitarism, computing, simulation and cyber law. The ambition for this event is to stimulate ongoing cross-disciplinary discussion and further research on this topic, drawing on the resources of the Lancaster University centres that are its co-sponsors. Christiane Wilke, Associate Professor in Law and Legal Studies at Carleton University, Canada. She has been researching legal responses to state violence and is working on a project about visuality, photography, and international law. To indicate your interest in participating, or for further information, please contact Lucy Suchman l.suchman@lancaster.ac.uk. I’m really excited about this; I’m part way through Shane Riza’s book, and it’s already clear that I’m going to learn a lot from the meeting. 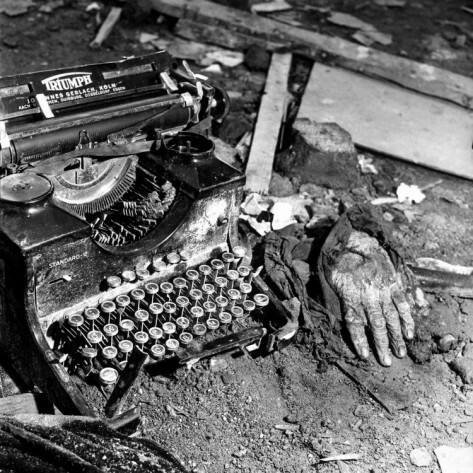 The image at the top of this post comes from the CFP, incidentally, but the image below is Margaret Bourke-White‘s classic photograph from the rubble of a bombed German city, which I use when I talk about the ways in which the trauma of air war dislocates the very sinews of language and the capacity to write and re-present (see ‘Doors in to nowhere’, an extended reflection on W.G. Sebald: DOWNLOADS tab). Perhaps I’ll use my time at Lancaster (given the name, a peculiarly appropriate place) to join the dots between the two images and revisit ‘The natural history of destruction’ for the twenty-first century…. This entry was posted in arms and weapons, bombing, conferences, drones, late modern war, security and tagged automation, drones, Lucy Suchman, remote control, security, W.G. Sebald by Derek Gregory. Bookmark the permalink. Derek Gregory with news of a conference entitled ‘Security by remote control’ in Lancaster in May.